Wow its unbelievable. to capture your photo from 360 degree angle. This time camera is in the ball shape. We never assume any camera in ball shape. This is very handy as well. How It Works: Its so simple. Simply throw the Panorma into the air. The cameras will automatically trigger at their highest point, giving you the perfect panoramic shot without ghosting effects. You can also hold the camera in your hand and use it manually, by pressing the button or remotely via the Panono app. The Panono Cloud offers you everything you need to manage your panoramic shots. You can explore your panoramas in your web browser. Move within the picture and zoom into the details of 108 megapixels..
How it is Diffetent with other Camera: It is different by its shape i think no one think any ball shaped camera it is different thing na. 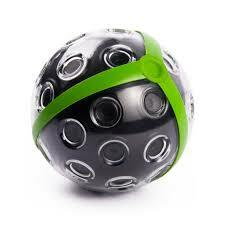 I really like this panoramic ball shaped camera. What u people think about it share your comments below. This post is dedicated to web developers who build web applications. When we are talking about websites its common sense that we are talking about html technology. Html (Hyper Text Markup Language) is famous as web language which is easy to learn and can be written in notepad. But now a days no one like to code in notepad software that comes with windows just because of its clumsiness. Here are lots of software for html coding which can also help you to find errors and plus point is that they comes free of cost. User don't need to pay for full version. Online Notepad is also an option but not worthy for crating web applications. Its just helpful for editing small files. Here is list of famous free editor software. Nodepad++ is most common and very flexible software if you are talking about html editor. I personally use this software, latest version of this also help for suggestion. You can download its installer as well as zip file from its official site. Its current version is 6.6.8. Best thing is its small size and easy to use. You can download notepad++ from this site. Microsoft product webmatrix really improves from its previous version. It recently updated itself from version 2 to version 3.Webmatrix is really good for beginners and have some advance changes like it allows you to install plugins in your software. You can add shopping cart, mobile support and lots more plugins within it. It is open source software which comes free so another plus point. If you are developing big application and working with ruby, php, ajax, jquery then aptana is best for you. It includes a lot of great features for HTML and CSS development. If its not wnough, you can get extensions for it to add on languages or other helpful features (like special characters). Komodo comes with two versions. One is Komodo Edit and other one is Komodo IDE. Komodo Editor is open source software that comes free of cost. Komodo Editor has tie up with Eclipse and CoffeeCup Free HTML Editor. Eclipse is very famous editor software but more complex that above described software.It has lots of options. Mostly who work with java and other framework of java use Eclipse. It allows you to add plug-in. You can work in java, web technology in this editor. Eclipse allow to add plugin from marketplace. It also support mobile development. Netbeans is basically Java IDE but also help to develop Robust Web applications. Its not so famous, Eclipse took all the popularity but i assure that it is great IDE having all features like Eclipse and provide good assistance also. If user is working with Netbeans then he will find it more user friendly than any other Editor. These listing are according to user experience.